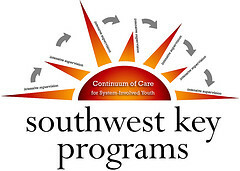 (Community Matters) I’m still receiving emails from parents and parties engaged with Southwest Key. The latest news of concern, which I have no way to verify but hope board members will, is that key employees are being given interests in closely held companies and family members being given jobs as a way to stymie dissent and stifle voices. I hadn’t thought about board members being similarly conflicted and don’t imagine they’d allow this to happen. I’m also hearing growing voices of dissent about the costs charged to Austin Prepatory School by SWKey and the singular control exerted by SWKey Founder, Juan Sanchez. I am a former high level administrator at EACPA. I have reviewed the school’s charter many times. The charter does specifically state that no outside entity (i.e. Southwest Key) may have anything to do with the management of the school. In fact, the charter states that the school may not have a management company at all. All school matters must be run by school employees. Having seen the bills many times, I can tell you that Southwest Key charges the school management fees. I can also tell you that the school board members, not the school administrators, are ultimately responsible for this violation of the school charter. It is also true that Southwest Key manages grants awarded to the school and acts like they are their own. It is true that Dr. Sanchez’s wife, who does not work for the school, runs the school grants. Finally, I know from current and former school employees that Dr. Sanchez is no longer even on the school board but he is still making hiring, firing, and financial decisions for the school. School officials are sharing confidential information with Southwest Key and the school board is complicit in allowing Southwest Key to profit from state education dollars by overcharging the school and profiting from the school’s lease agreements. I feel compelled to leave one additional note. I do not know if this practice is still occurring, but during my employment, Southwest Key was working to push board members who had ties to the school off of the school board and replace them with board members who were either affiliated with Southwest Key or actually worked at Southwest Key. The Southwest Key board actually has to “approve” new members to the EACPA Board of Trustees AFTER the EACPA school board has already voted to elect the new member. This is a clear violation of state education codes. Thank you Eugene for publicizing this matter. It is no wonder that the state did not wish to give Eastside Memorial to Southwest Key. This would have just been one more campus for them to profit from.